Why do bad things happen to good people? Conversely, why do good things happen to bad people? These same questions in one form or another echo down through the centuries. The Old Testament reeks of human drama - the "good" suffering while the "bad" go unpunished. The psalms call for justice while the perpetrators seemed to be blessed? Why do Christians suffer along with those who don't give God a tinker's curse? There is no easy answer to this dilemma and the Bible is strangely quiet as to why an all powerful God does not intervene to right situations which are obviously wrong. The young mother with cancer, the child run down in his own back yard by a drunken driver, the youth killed for his joggers by a drug addict; why New York City, Washington? All of them human tragedies for which there seems to be no reason. On a bigger scale, earthquakes, floods, and other natural disasters which take millions of lives every year. The injustices of the world, ethnic cleansing, wars, economic and social repression; why, why, why? Does God really care is a legitimate question to ask. If you take God's Word in its entirety - the Bible - there is a resounding YES. God does care! As Jesus, God cured people's sicknesses and wept at the death of his friend Lazarus. Even Jesus endured indescribable pain as he died on the Cross. From Jesus' own lips he cried to his Father "why have you forsaken me." But if God cares, how do we reconcile this apparent reluctance for God to act with the all-powerful God of the Universe. The answer may lay hidden from our sight and understanding. St Paul alluded to this when he referred to the spiritual war that was raging in the Universe. What happens here on earth is just a pale echo of the grinding, groaning war between good and evil. We are the foot soldiers in this war. It really does matter that we hold the faith when it seems pointless, it does matter that we invoke forgiveness rather than retribution, it does matter that we love rather than hate. It does matter that we extend compassion when we seem to come off second best. It does matter that we claim victory when the battle seems lost around us. We are co-fighters with God against the power principalities of darkness. When Jesus entered the world the whole of Creation shook. God served notice that Evil had its day. God has promised that one day there will be no pain and every tear will be wiped away. All of what is happening now will be like a distant memory. Our questions now will be like those we asked when we were children. They will seem so obvious and naive. In the meantime God does not ask us to understand him but love him with all our heart, and all our mind and to love others as we love ourselves and as he loves us. All members of our Life Support family are affected by the terrorist attacks in the United States today, September 11. Some of our readers may have actually been present at the scenes of the attacks; others may have lost their lives and many lost loved ones. Most of us watched and listened from afar as these horrific events unfolded. rejected the Sermon on the Mount." Today's attack on American civilians demonstrates again our world's intimate relationship with killing. 1. Remember, most persons of particular nationalities and religious or ethnic backgrounds are NOT in favor of attacks upon innocent men, women and children. Such atrocities come from extremist and radical groups. Our anger, though justified, should not broadly target innocent civilians of nation or persons who simply happen to represent a certain religion or ethnicity. against a common evil. We can dedicate ourselves to the cause of ridding the world of terrorism. communities have disaster relief funds that are set up to receive donations for this emergency. Those of faith should also pray for those who lost loved ones, those who are missing and wounded and those who labor to rescue and comfort victims. Pray also for victims and perpetrators of violence throughout the world. terrorism, and to groups that give aid to victims of violence and war. 6. Rededicate yourself to loving others. Life is short -- cherish every moment of it. America will never be the same again. September 11, 2001 will forever be remembered as a defining moment in our history. But let the history books record it also as a time of unparalleled cohesiveness as nations unite to comfort a country in grief and to commit together to rid our planet of the scourge of terrorism. May God grant us wisdom this pivotal day, comfort as we grieve and healing as we move ahead together. It was a picturesque morning in late summer. The sun was shining. The air was crisp and clear. Life was good. Within minutes, our outlook on the world, our communities, and our families changed -- forever. In the blink of an eye, what was considered invulnerable became vulnerable. What was safe was now dangerous. No one could have expected it. No one could have even imagined it. Cries of "Pearl Harbor" echoed on the television and among friends and families on the phone. A new generation of Americans had suddenly discovered what it must have been like for their parents and grandparents -- only this time, it was worse. Social and political commentators, journalists, and military experts were at a loss. No one knew what to say or how to react. The world came to a grinding halt as the shocking news spread and people found themselves paralyzed with confusion. Beyond the destroyed buildings of crushed metal and glass, there were the countless victims. Innocent people who were killed or injured over issues they knew little or nothing about. There was no sense to it. No explanation. No easy enemy. Those responsible were unknown and unseen. Bombs weren't used -- the weapons of choice were civilian passenger planes laden with fuel. The horrifying and surreal scenes of destruction have done two things. Yes, they have made us sad. But more importantly, they have helped -- no, they have forced -- us to put our lives in perspective. What seemed so important on Monday, seems so insignificant today. Within a few short hours, our thoughts and priorities shifted. Oh, the world will keep spinning, however, our minds and spirits have been transformed. The things we took so seriously, the things we stressed about, argued about, worried about -- all of those personal issues that were consuming us -- are hardly noticeable now. The things we believed constituted a "crisis" before turned out to be nothing more than trivial. As parents struggle to explain this to their young children, thousands of American families will be attempting to do what they think is impossible -- putting their shattered lives back in order. Americans will come together and the massive response will show our true colors as a nation. Our government and volunteer resources will unite in the rescue efforts. Citizens from every walk of life will respond in droves to Red Cross blood drives across the nation. And we will see stories about ordinary people who did extraordinary things to help and save complete strangers during this devastation -- true angels who spread their wings of safety around those who were caught in a web of terror. Heroes will abound and prove, as always, that good can, and will, overcome evil. But why? Why does it take a tragedy of this magnitude to remind us what's really important? Do we have to lose so much to understand? take for granted? I don't know. I only know that we will look at the world differently. Maybe we will be more cynical, more careful, more determined to seek the truth. Regardless, we will look at our friends and family with a new eye -- more loving and forgiving, less judgmental and with the total realization that we only have each other for a finite period of time. Because all we really have is each other, our freedoms, our faith, and the hope that our painful path to recovery will allow us to shape a peaceful world for our children. but my mind doesn't know what to say. as a Patriot of "The Land of the Free and the Home of the Brave." The world changed this morning. A thick cloud of smoke and dust still hangs heavily over the New York City skyline. Firefighters and emergency personnel are responding to crises in New York and Washington, and who knows where else. Confusion and concern dominate the nation?s airwaves, as America collectively grapples with...what? No one seems to know for sure. As this is being written, the full extent of the tragedy is unknown. But this much is certain: the world changed this morning. Lives have been lost. Families have been forever impacted. Businesses have been destroyed. And the cultural landscape of the world?s most free and secure nation has been altered just as surely and just as permanently as has been the physical landscape of New York City. The events and images of this day will remain with us, burned into our minds and souls, for years to come. We will all remember where we were and what we were doing when we first heard the news, just as earlier generations remember Pearl Harbor, the day President Kennedy was shot, the Challenger disaster or the Oklahoma City bombing. 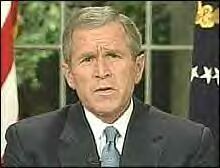 September 11, 2001, will join other dates of infamy among the historical landmarks of our generation. Watch TV news reports with your children. They are going to be just as interested in what?s going on as you are. So watch together, and then talk about what you see and hear. Try to help them understand, as much as possible, what they have seen. Talk with your children about what they are feeling. There is no one right way to feel at times like this. We feel what we feel ? that can?t be controlled. It isn?t as important WHAT our children feel, as that they be given the opportunity to talk about it, and to deal with it. Mourn with your children. We all grieve in our own way. Some do it with tears, others with laughter, others with silence. Let them grieve, and let them see your grief. And then talk about it. Share it. Experience it together, even if you experience it differently. Pray with your children. This is a time for faith, a time to draw courage and strength from our beliefs, whatever they may be. Gather your children and pray for the victims and their families. Pray for the men and women who are risking their lives in rescue efforts. Pray for the medical personnel whose skills and endurance will be sorely taxed in the coming days. Pray for the president and all who will be making decisions regarding the appropriate responses to these acts of violence. And while you?re at it, pray for the rest of us. After all, we have to live in this world. And the world changed this morning. On July 15, 1937, a baby girl was born. I was that baby girl. When Pearl Harbor was bombed on December 7, 1941, I was a month short of being four and one-half years old. As little as I was, I remember that day and the feelings that pervaded the very air that we breathed. I heard the words that it was a day that would "go down in infamy." A small child heard words that would stay with her all her life up to now. When Oklahoma City suffered the devastation a few years ago I thought of those words and felt the deepness of sorrow for this land of ours. As with all of us who stayed glued to the television, I felt this was as bad as it could get. This morning a friend rang my doorbell and told me what had happened in New York City. Once again I heard the words in my head. This is a day that will "go down in infamy." Again I have been glued to the television, switching from station to station, listening to the different views, watching the different scenes and forming opinions of all that I envisioned. In our church we have been challenged by a small prayer called the Prayer of Jabez. It is a one sentence prayer found in the Old Testament in I Chronicles 4:10.
that I may not cause pain!" The Prayer of Jabez Devotional Book explaining this wonderful little one sentence prayer can be found in local bookstores I'm sure. I found mine in the book aisle of a Walmart store. These words have been in our bulletins a long time, but for some reason I wasn't ready to delve into it. On September 8th I was led to pick it up and I read it in one setting. I'm ever so glad I found it at just the right time. Four things Jabez asked God, that he would be blessed, his territory would be enlarged, that God would be with him and lastly that God would keep him from evil that he might not cause pain. I wondered today if this simple little one sentence prayer had been prayed by everyone each morning, if what happened today would have happened. I know I was reaching out in my thoughts for the rope of human kindness to be in all the world but I was comforted in some small way. Today what has happened will be the "day of infamy" for this generation of young people, a day that will not be forgotten in their lifetime. I'm ever so proud of the people in America. They are reaching out to help those in New York City with everything that is in them. We will not be beaten, we will rise again, we will be intact, we will survive for we are proud to be an American. December 7, 1941 a day that went down in infamy for us who grew up in that time frame. Today is the day for those who are growing up now. We came out of that time and we shall come out of this time too. Tonight I was writing in my daughter's journal of her exciting journey into the world of potty training. We celebrated the big event just yesterday with a pizza party, just her and Mommy. Actually, I ate pizza, she ran wild... she just turned two, you know. For today?s entry, I detailed the first successful use of "the potty" in our new adventure. You see, I notate all significant events throughout the year and then I attach them to a birthday letter, written especially for my angel for her to read years and years from now. One for every year. were today. One is of life...the other of death. Oh I hugged you even tighter than usual today, my angel." Then the irony struck me...and suddenly allowed me to make sense of this day. No, I still cannot make sense of the horrific tragedy that has descended upon our nation. However, the irony of this day was that while destruction was reigning in my nation -- the nation I joined the Armed Forces when I was but a young girl and vowed to defend even with my life -- my little angel was still growing up. It's my job to help her and for today, that is all I can do. I would like to offer my deepest condolences to the American people, whether you had someone involved in this tragedy or not. We all feel the pain and destruction even if most of us are not experiencing a personal loss of a family member, friend, or co-worker. I myself have family members in the NYC area and though each and every one are safe and sound in their beds tonight, I know many families are not that fortunate. are still the greatest nation on this earth. In our children?s history books. Check out Lynelle's web site to read more of her writing! After reading your story sat down and let my thoughts run free to relieve the pain I felt for those who were caught in this terrible war. enjoy all I receive from this site. what could it possibly mean. I see on the tv as it flashes across. To show the victims , they are not alone. Doesn't seem as if it's enough! Is this a heartfelt prayer. So all this was not in vain. members of your news letter some suggestions from a HeartMath Coach. world ... personally and collectively. morning, a crisis that will ripple in the rest of the world. into a constructive response to this situation. * Attend to your emotions. This is key. emotions and allow them to support you as well. * Go to your nearby hospital or clinic and give blood. do make a difference in the lives of yourself and others. means for mobilizing constructive responses. will likely find multiple ways in which your help is needed. choose your responses responsibly, intelligently, wisely. What have they done to thee? And come to roost this day. Where Liberty still stands proud! Fueled by hate's jealous rage. Of the most insidious kind. WE HAVE OUR LOVE TO BUILD US UP! Who now reside with you. That they Your peace may find. And give our heart?s some ease. As they dig out the dead. And heal our hearts we pray. I reside in western New York and have two wonderful children and a delightful grandchild. I work in the human services area and also do freelance proofreading and copyediting at home. I have written poetry all of my life as a way to deal with whatever is going on around me. You can E-mail me at: GramLin99@aol.com. Please visit my website at: http://www.geocities.com/reflectionsofmysou/index.html. There will even be some who assert there can be no God, for no loving God would allow such a tragedy to occur. Ironic if it turns out that these acts were carried out in the name of religion and on behalf of someone's god.A tragedy like this makes us pause. Priorities are soon straightened out. You give your kids an extra tight hug. You kiss your wife longer. You call dad and say, "I love you." You pray--for survivors, for the nation, for safety, for yourself and your family.One minute you head to work, or are beginning work. Then a "We Interrupt This Broadcast" event occurs. You listened intently to the radio, or watch the recap on television, as the initial tragedy occurs--a high-rise skyscraper is aflame, and it appears a plane has slammed into it. One might think of 1945 and a military plane flying into the Empire State Building in fog. And you wonder why it doesn't happen more often (you later learn that flight paths are deliberately set up to avoid the towers or, as residents in Tempe, Arizona, now know, the placement of buildings is studied for possible interaction with airports). And as you watch, the unthinkable happens. Another jet comes onto your screen. You are too numb to give it a second thought--a plane passing in the distance, perhaps. It even seems outsized to the untrained eye not used to seeing jumbo jet and skyscraper in close proximity. After the jet disappears from view, seconds pass when a fireball appears. At first, it is assumed the second tower catches fire from the first. Then the full impact of the event hits--a second jet has slammed into a second tower and you soon feel this is no longer just an airline accident but a much greater tragedy. It doesn't take long before the news comes that a third jet has slammed into the Pentagon. A fourth drives into the ground 80 miles away from Pittsburgh--no readily apparent connection, but by this time all your senses are on edge and you just feel that there has to be a connection, it cannot be a coincidence.Within an hour after the attack on the World Trade Center, the first tower crumbles, weakened by the steel-melting flames and the weight of the top stories and a jet it was never built to support. And even though one tower collapses, the second collapse was equally surprising and horrifying. Police and Fire personnel, believing they had time to rescue victims, became victims themselves. Estimates run into the thousands, ten thousand possibly, although many pundits feel that is a conservative estimate. Even as I write this, there is hope in that victims trapped in the rubble are calling on their cell phones.Which makes us pause. Security has suddenly become iffy--in fact, many areas were closed and evacuated because of uncertainty about what might be hit next. Life is a fragile and precious commodity. Ball games and concerts are cancelled because, well, large congregated crowds are a target and no one feels like enjoying sports and the arts when death and destruction hang heavy in the air.On a typically Tuesday morning, real people were living real lives. A couple making plans for a romantic dinner that evening. A group of office employees planning an outing at a ball park. People swapping jokes at the water cooler. A husband calling his wife, letting her know he arrived safe at work. Computers were booting up getting ready for another workday. Managers and executives compiling financial data collected on the desktops overnight. E-mail and newspapers being read. Some may have been eating breakfast at their desk, or returning to their desk with a fresh cup of coffee. Everyday events we take for granted. And, likely, workers in one tower looking out the windows at the tragedy next to them unaware that another jet was about to hit their building. And in the midst and aftermath of the tragedy we learn there are no promises. We are not promised another birthday. We are not promised another month, day, or hour. We are not even promised a proper Christian burial.Later in the day, a wife will not see her husband walk in the door--and she will have no definitive word. Someone's mommy or daddy will not pick them up and hug them again. Sons and daughters are gone, bringing grief to parents.But God is still near. Everywhere prayer services are hastily organized and many of us in shock, outrage, anger, numb from the events gather to find peace and solace in God's word and comfort from each other. We give hugs, we exchange tokens of affection. We cannot bank on being here on earth today or next week or next month or next year. We can't even bank on getting home! For some, occupational hazards make this truth very real. For others, unplanned tragedies fall upon us. While a co-worker's statement seemed cold and callused, it does serve as a reminder: "I guess the New York Times obituaries will be a complete section." Death is a part of human existence. In one day it claimed lives on a grander scale than normal. But death strikes and claims lives. And as tragic as the events of 9/11/2001 are, an even greater tragedy is people dying without faith in God's promise of a Savior from sin. May we see an urgency in sharing this Good News with all. In the days and weeks leading up to the travesty, politicians debated defense spending and defense programs. We were told that the Army was "all that it could be" and the Marines have "a few good men." Security at airports was considered safe--although my pastor often wondered how trustworthy security manned by guards making minimum wage was. How much are you willing to risk your life for? Or the radio announcer who reported several years ago leaving his car outside the Milwaukee airport terminal to get his luggage and returned to find an officer writing a ticket. The reason for the ticket? Because the car was unattended outside an airport terminal and could be a terrorist threat. So, the ticket does...what? Obviously no government agency was prepared for what happened--and if so, what can they do? Shoot a plane full of civilians out of the sky? And it was men who wreaked this tragedy upon mankind.And among all this is God. God sifts through the rubble and gathers his children--some for eternal glory with him, others to live for another day and days of service here on earth in His Kingdom. This isn't the first tragedy--in two weeks we will have thoughts from Nairobi, Kenya, about the bombing of the American embassy. A month ago, my parents stood on the site of the Alfred Murrah Federal Building and were humbled by the event that shook our nation there. The events of 9/11 brought to mind the previous attack on the World Trade Center, Pearl Harbor (the last attack on US soil), and the assassination of President John F. Kennedy (as to where we were when we first heard the news). And this will by no means be the last tragedy (unless our Lord returns). But in this transitory and fleeting world, a life that has no promises in the mortal realm, we have the promises of God. God fulfilled his promise of a Savior and has taken eternal death away. Physical death is now the Christian's portal to the heavenly palace. And our guilt is taken away--guilt over actual sins committed as well as "survivor's guilt," which if experience is a teacher will be sure to follow.Keep in your prayers survivors, families, rescue workers, and our nation. Give your child a hug and your wife or husband a gentle touch. Say a prayer to God.But most important, keep in mind that your life can be cut short in a moment. Take to heart God's promise that he has made you his own child. God, please bless America again! I am a retired consultant for Jostens Printing and Publishing in Topeka, Kansas. I live alone and love to write poetry, read, and crochet. I have two beautiful children and three grandsons, the oldest of which we lost at the age of 20 in an auto accident. As all Americans are, I am greatly saddened by the recent tragedy we all suffered. I am proud to be an American, though, and behind our President 100%! Where in lies the wisdom. Inside of man is more. Out of ashes, rise victories. My name is Betty King; I live in Phoenix AZ. The above are just some thoughts on the happenings of the past week. The quote below is from U-inspire.....it holds a great hope for us all. 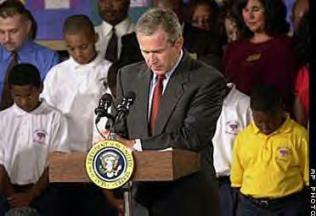 A grim-faced President Bush mourned the deaths of thousands of Americans in Tuesday's atrocities. ''Today, our nation saw evil,'' he said.